Kevin Chappell leads the Texas Open with a round to play, the Californian handling difficult conditions at the TPC San Antonio better than anyone yesterday. Chappell, 33-1 on tournament-eve, recovered well from a double-bogey at his sixth hole to compile a flawless three-under-par back-nine. Three birdies in his final five holes left the US Tour maiden at eight under par and 4-1 favourite. Chappell, arguably the best player on the US Tour without a victory, is one shot ahead of Branden Grace and John Huh. Ryan Palmer leads the Texan challenge, sharing fourth place a further shot behind, alongside halfway pacesetters Tony Finau and Bud Cauley. Matt Kuchar, ante-post 20-1 market leader, has run his race, a third-round 75 dropping him to three over par and a share of 59th place. 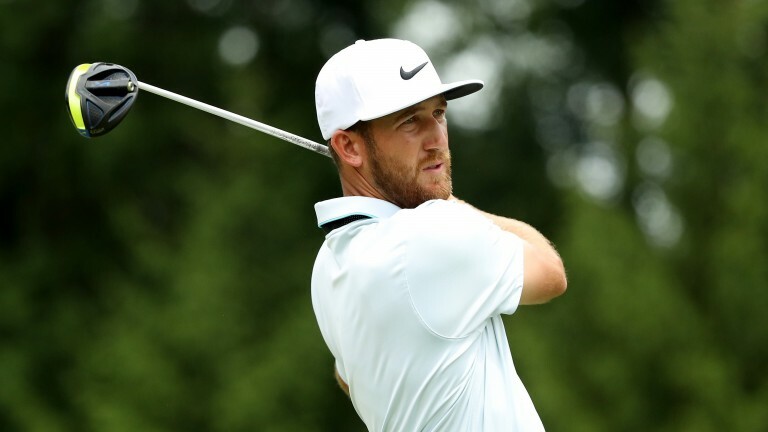 Kevin Chappell held himself together manfully in the wild weather of the Lone Star State in round three and this quality player may finally get the US Tour victory he deserves at TPC San Antonio. Chappell is well suited to this venue, where he finished runner-up in 2011 and fourth last year, and his game has peaked nicely for the tournament. The 30-year-old controls his approach shots superbly and the way he putted over the closing holes of round three bodes extremely well for Sunday's Texas shootout. Chappell has finished second six times on the US Tour, four of those near-misses coming last season, with two at the hands of Jason Day and one by Rory McIlroy. Short-game issues have held this top-class ball-striker back, but he finished seventh in the Masters last time out and has found some confidence on the greens. The leaderboard is bunched and Chappell will realise that he needs to push on from his score of eight under par – less breeze is expected for the final round and birdies should be more plentiful – but he is well capable of doing so. Racing Post Sport followers are on Chappell each-way at 33-1, the headline ante-post selection, so there is no need to support him further. But who are the main dangers to the tip? Branden Grace has been poor by his standards this year, but the South African has enjoyed the conditions at TPC San Antonio. His low ball-flight and ability to grind well means the wind is his friend. Last year's Heritage champion is obviously a danger, but he has been struggling to stay in top gear for four consecutive days this term, and the drop in breeze is unhelpful for him. Ryan Palmer was the star of Saturday, humbling the wind with a round of 68, and the 40-year-old Texan has a chance of ending a long victory drought. The third and last of Palmer's wins came in January, 2010. He could be inspired on home turf to finish the job, but has been untrustworthy in contention over the last few years. Three promising youngsters could conjure something special in round four – close eyes need to be kept on Bud Cauley, Cameron Smith and Robby Shelton – but punters looking for some cover for their Chappell investment should probably concentrate on proven winners. Tony Finau and Martin Laird at six under par, and Brooks Koepka at four under, could hustle Chappell from just off the pace. Finau won his maiden US Tour title last year, while Laird has three victories to his name, the last of which came in the 2013 Texas Open on this course. Koepka, the 2015 Phoenix Open champion, was impressive in round three and can be expected to finish with a flourish. Finau at 10-1, with bet365 offering each-way terms of a fifth the first four places, is probably the best cover-shot for Chappell backers. Final-round threeball punters are pointed towards Shelton (4.30pm UK and Ireland time), who looks a class act on his way to big things. He has just secured a place on the Canadian Tour, which will probably provide a stepping stone to the Web.com Tour, with the eventual destination the main circuit. Shelton looks a bargain at 5-2 to outscore veteran Bob Estes as well as Aaron Baddeley, who completely lost control of his driver late in round three. Ryder Cup star and Masters contender Ryan Moore looks a strong favourite in the 4.10pm contest against Jhonattan Vegas and Sung Kang. The final threeball of Chappell, Grace and John Huh is scheduled to tee off at 5.20pm.